A pair of Knoll end tables with tulip bases designed by Eero Saearinen. These examples with a unique almost solid grey marble. Wear consistent with age and use to the bases. With some light scuffing and scratches to the bases. The tops have even finish with darker veining streaks natural to the material showing through. Both tops and bases are labelled and estimated to be 1990s production. Dimensions: Diameter 20" Height 20". As a company that produced many of the most famous and iconic furniture designs of the 20th century, Knoll was a chief influence in the rise of modern design in the United States. Led by Florence Knoll, the firm would draw stellar talents such as Ludwig Mies van der Rohe and Eero Saarinen into its compass. Their work would help change the face of the American home and office. The company was formed in 1938 by the German immigrant Hans Knoll. He first worked with his fellow ex-pat, the Danish designer Jens Risom, who created furniture with flowing lines made of wood. While Risom served in World War II, in 1943 Knoll met his future wife, Florence Schust. She had studied and worked with eminent emigré leaders of the Bauhaus, including Mies, Walter Gropius and Marcel Breuer. She won Knoll over with Bauhaus notions of industrial arts, and an aesthetic that featured flat and tubular metal frames and angular forms. When Hans died in a car crash in 1955, Florence Knoll was appointed head of the company. It was as much through her holistic approach to design—a core division of the firm was dedicated to planning office systems—as Knoll furnishings themselves that she brought about the sleek and efficient transformation of the American workplace. Today, classic Knoll furnishings remain staples of modern design collections and decors. A history of modern design is written in pieces such as Mies’ elegant Barcelona Chair, Saarinen’s pedestal Tulip chair, Breuer’s tubular steel Wassily chair and the grid-patterned Diamond chair by Harry Bertoia. As you can see from the items on the following pages, these designs and others have become timeless emblems of the progressive spirit and sleek sophistication of the best of Modernism. Pair of Eero Saarinen designed 20" inch diameter "Tulip" side tables made by Knoll with aluminum base and laminate top, Circa 1956. Gorgeous pair of Eero Saarinen tulip side table for Knoll. Walnut tops and cast iron bases with original powder coat. Knoll bowtie label dates these to approximately the mid-1960s. Eero Saarinen, Knoll Associates Inc. 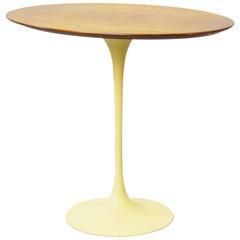 Early production Eero Saarinen for Knoll cast iron base tulip table. Top is custom-made cement. Vintage original Saarinen for Knoll oval tulip table. Cast iron base with white laminate top. This example shows some cosmetic wear normal and consistent with age. 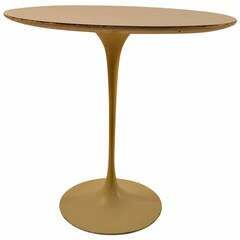 Early Eero Saarinen for Knoll oval tulip side table. Retains early Knoll label.